Welcome to the Biwako Music Festival official website! 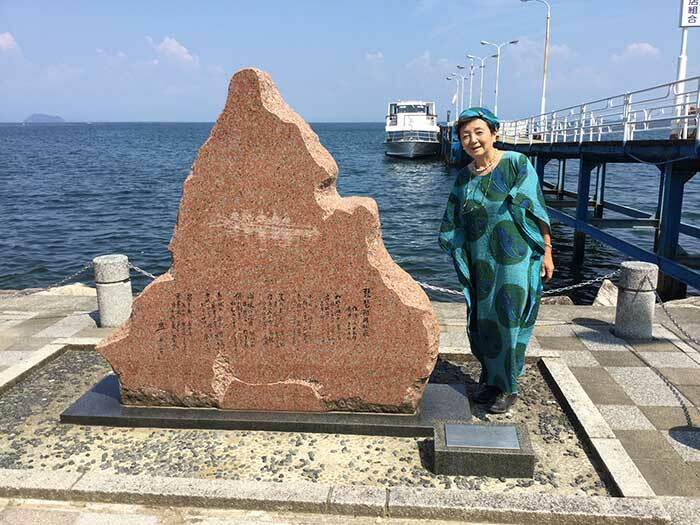 Yukiko Kada and the Biwako Shuko no Uta song monument at Imazu Port, Takashima. We are a volunteer committee (琵琶湖周航の歌１００周年記念事業実行委員会) organizing the annual Biwako Music Festival (Biwako Ongakusai びわ湖音楽祭) held along Lake Biwa in Shiga Prefecture, Japan. Headed by Yukiko Kada, former governor of Shiga, our committee includes prominent people active in education, music, and water sports in Shiga. 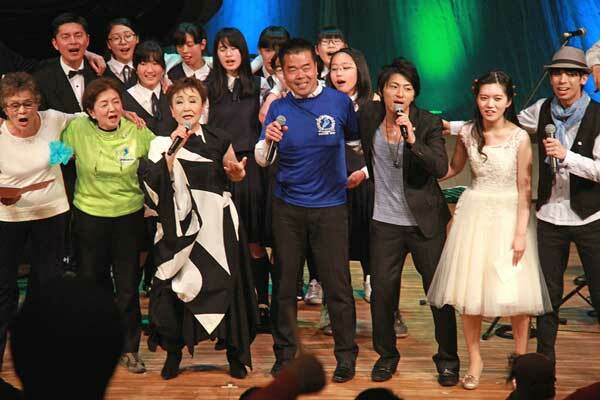 We work together with singer Tokiko Kato to produce the music festival. The Biwako Music Festival is held to perpetuate Shiga’s beloved song Biwako Shuko no Uta (琵琶湖周航の歌 or Lake Biwa Rowing Song) to the younger generation, give local and young artists a chance to perform in public, and promote local culture, music, sports, and lake preservation. In 1971, singer Tokiko Kato scored a major hit with Biwako Shuko no Uta, making it nationally famous. It was actually Ms. Kato’s idea to start this annual music festival. We are grateful for her help. Our 1st Biwako Music Festival was held on June 30, 2017 at Biwako Hall in Otsu to commemorate the 100th anniversary of Biwako Shuko no Uta. It was held in conjunction with a successful four-day rowing excursion (Nazori Shuko) around Lake Biwa undertaken by Kyoto University Rowing Club alumni. Like the song that takes us around the lake, the Biwako Music Festival will also travel around the lake every year. In 2018, the 2nd Biwako Music Festival was held in the Omi-Maiko and Wani area in western Otsu, the setting of verse 2. The 2nd Biwako Music Festival had a few pre-events on April 21 and May 19–20, 2018 and the main event with a concert by Tokiko Kato on May 20. Click on the title links to see photos on the Japanese page. *To be canceled in case of rain. Local artists and music groups from local schools will perform. Reed flutes, Taisho-goto, violin, and more. Camp overnight, bake pastries, setup tents, learn how to kayak (beginners welcome), dinner, and learn how to sing Lake Biwa Rowing Song in English. On the next morning at 4:30 am, leave shore for sunrise kayaking. After breakfast, more kayaking from 10 am to noon to Wani. Price includes a concert ticket to see Tokiko Kato on May 20. When: From 1:00 pm on May 19 to 4:30 pm on May 20, 2018. Cost: ¥18,000 to ¥21,000 depending on accommodations type. The concert featured mini concerts by local artists in the lobby at 12:15 pm–1:30 pm, Shiga Junior High School band, Konan Dance Workshop, and ~Lefa~. *If all goes well, hopefully we will be able to hold the 3rd Biwako Music Festival in Imazu, Takashima in 2019. 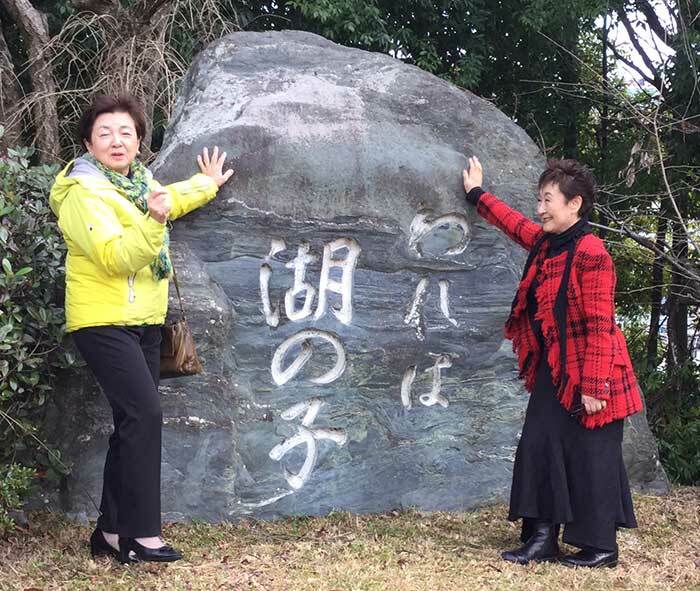 Yukiko Kada and singer Tokiko Kato at the Verse 1 song monument in Mihogasaki, Otsu. 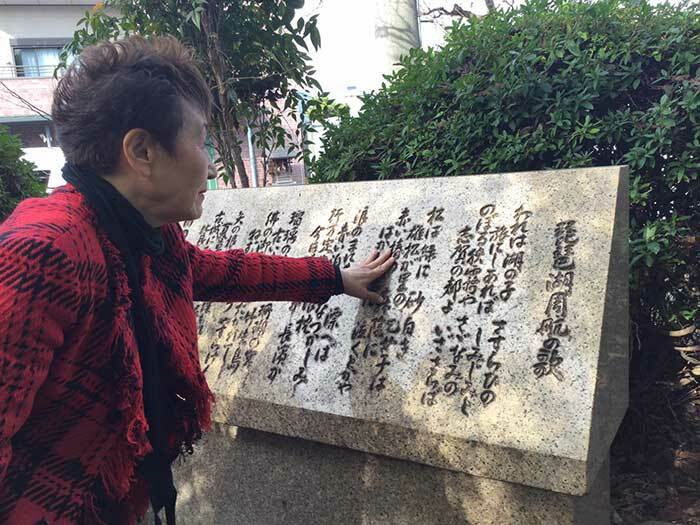 Singer Tokiko Kato at the song monument in Otsu. There is a song monument for each of the six verses and monuments for the entire song. Verse 1 Monument (Otsu): From JR Otsu Station, take a bus to Mihogasaki. It’s about 10 min. Or you can easily walk it from Hama-Otsu Station. Just walk on the main road toward the race boat arena. There will be a small marina on the right. Right after passing the marina, turn right into the small road. There will be a small park on the right. The monument is there. There are two stone monuments. It might be roped off and you’re not supposed to enter the park. While you’re there, walk around the marina and see the boathouse with the cherry blossom logo with three stripes. That’s the logo of the school and the place where the boys left for the rowing trip in 1917. Otsu Station also has a tourist information office where you can obtain directions and a map. Verse 3 Monument and song museum (Imazu): Near Omi-Imazu Station on the JR Kosei Line. Get out the east exit and walk on the main road toward the lake. You will soon see the Biwako Shuko no Uta Shiryokan song museum on the left. Be sure to visit this museum too. Walk further toward the lake and you will see Imazu Port. Near the water, you can see the “red fire” song monument. On the very end of the pier, and you can see the lamp monument. (The pier might be closed off if there is no boat, so you may have to ask permission to walk on the pier.) Omi-Imazu Station also has a tourist information office where you can obtain directions and a map.